Since 30 years Inspector John Sinclair of Scotland Yard is on the hunt. With Stakepistols, Holy Water and Silver Bullets crafted and blessed in a Monastery in Scotland. Vampires, Werewolfs and Demons alike fear him for the cross of Ezekiel he is wearing. An age-old artefact holding the power of the Archangels already wielded by King Solomon, Richard Lionheart and the Templar Master Hector de Valois. He is the son of light, a bastion of good and time and time again he and his friends have thrown the dark hordes back into hell. They fight Vampires in London, destroy super Demons in the dark forests of the Spessart, cross nefarious plans all over the world and are pulled into unknown worlds and strange times. And now you can join them in their mission. I am in the process of converting the world of the German pulp series John Sinclair to a Savage World setting. In essence it is a modern pulp horror setting in which all the characters are employed by a subgroup of new Scotland Yard simply called “The Department”. It is based on a weekly pulp series running since 1973 created by author Helmut Rellergerd alias Jason Dark. There are already more than 1750 stories published with a new one every week, so no shortage on source material! 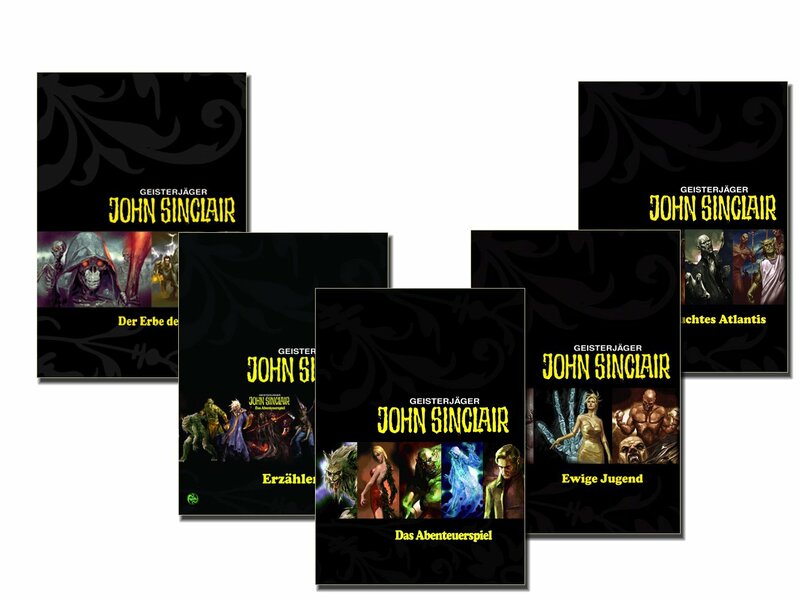 I will look to the John Sinclair adventure game from Ulisses Spiele for inspiration as we already started a campaign with that ruleset. The original game is written around a campaign which sees the characters start humble and stumbling unplanned into a nefarious plot full of suspense, horror and betrayal spanning around 12 adventures. The last book in the campaign was published just now and I do not have it yet. The setting is interesting and quirky. The adventures are very well structured, but sadly very linear. We are up to the second adventure only, but I am already tiring a bit. Mostly the mechanics leave to be desired. It all feels very constructed and gamey. I have a hard time getting inspired to wander of the written path due to the tight corset of the rules, which are written explicitly for the campaign and have new and amended rules and mechanics for each adventure. The adventure game itself is an RPG Lite at best, meant to introduce new players to PnP. On the one side that is a plus because the rules are really easy and preparation is quick. But on he other hand it has some quirks and limitations. It is also dice pool based which me and my players really dislike. Additionally it is so simple that growing your character is not really exciting either. It shares some things where you can see that Savage Worlds and similar systems must have been an influence. For example it has “Fate Points” similar to Bennies and characters advance through “Talents” which roughly are equal to edges. Something similar to “Adventure Cards” is also in use, for Players and GM alike. The main differences to Savage Worlds are the dice mechanics (D6 Pool) and the way “Edges” work. Hence my decision to move to Savage Worlds as they are quiet similar in many ways but different enough to turn it FFF!. So much of the material translates easily, I believe I can continue using their dedicated “adventure cards” and converting work will be minimal. My feeling is that Savage Worlds will fit the setting nicely and converting the already existing characters to Savage Worlds wont be too hard either. I will post about the conversion up here in between my random ramblings and linkage when I have something done.